My grandfather grew corn every year on the farm for at least as long as I have been around. It was part of the crop rotation of corn, wheat, and soybeans, which he sold to elevators and fed to his hogs. 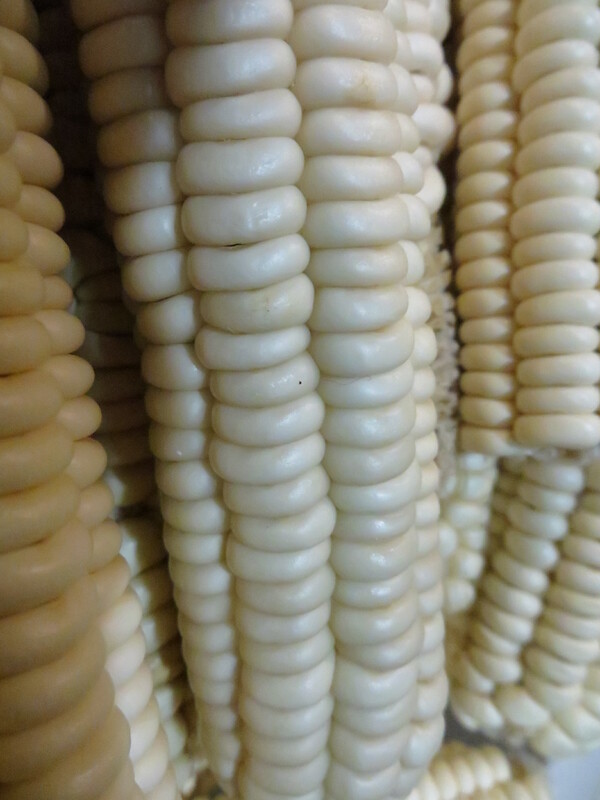 This corn he grew is called field corn, and is very starchy, harvested when the kernels are dry and hard, and is usually fed to livestock or ground into meal. I’ve grown field corn in my garden for the past few years. My children far prefer me to grow sweet corn, but I get discouraged about how much room it takes in the garden to get a few measly ears. If I am going to grow corn in my garden, I want tall field corn stalks with long, full ears. Field corn also seems hardier and more resistant to insect pests, not to mention the product has a better shelf life. William cleaned out the barn the other day and came in the house with a bushel of corn from the garden that I had stored in there months ago and forgotten about–white and yellow varieties. I had left the husks on so the ears were mostly in good shape. I shucked the corn, and had some little fingers help me shell it. [Hythe kept asking if he could eat the corn while we were shelling, but I had to explain a few times that this was not sweet corn and might break his teeth if he tried to eat if off the cob.] In years past I have made hominy, so I thought I would do that again. We like it in soups and I can make a lot and freeze it. I cook the washed kernels in 2 tablespoons of slaked lime for about 15 minutes, then let them soak for another hour. Then I wash the kernels in water, rubbing off all the outer coating. 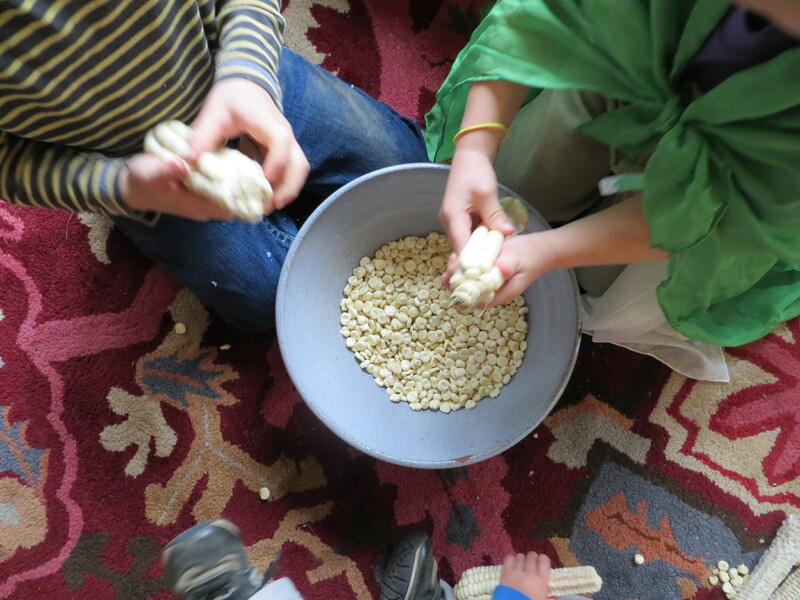 At that point the corn is ready to be cooked into hominy, or ground into masa. 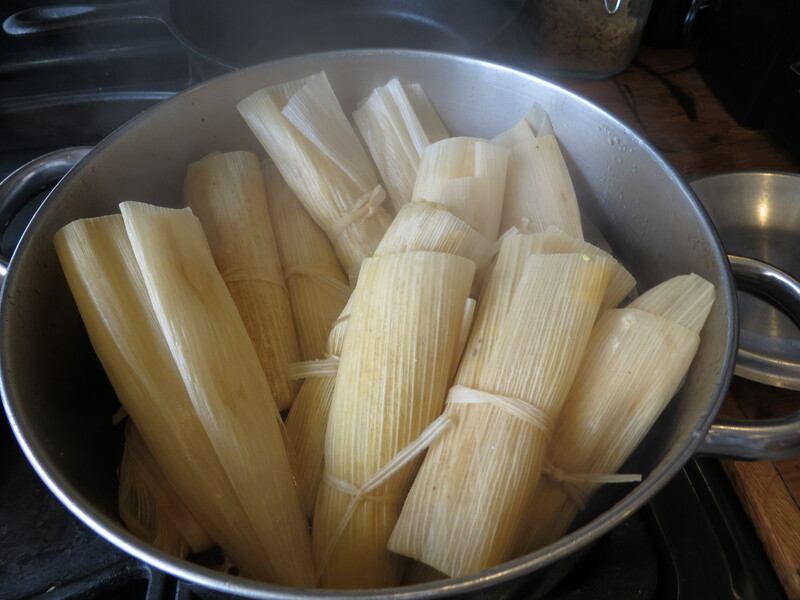 This time, instead of cooking it all into hominy, I used some to make masa tamal, or corn flour for making tamales. My girls love tamales so I thought I would try it. 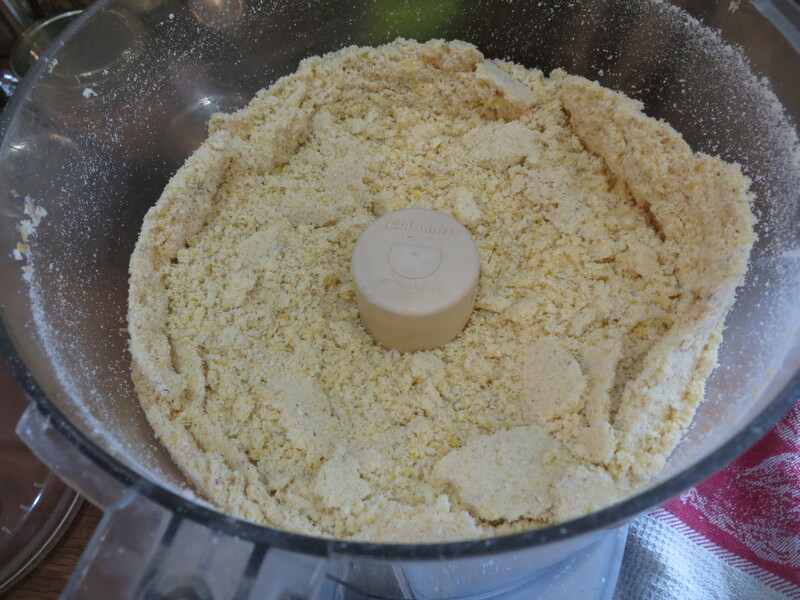 It was very easy–just a few minutes of whirring in the food processor. Then, I mixed the flour with lard and chicken broth. I had some great pulled smoked pork, so I used that and some frozen corn for the filling. Tamales are pretty easy to make, but can take some time. It did not seem as time consuming this time–maybe I was mentally prepared for a marathon cooking session and it was not that. Southerners are known for corn (not pasta or bread) and their corn products like grits, cornbread, and corn pone. I thought of these tamales as a metaphor for the convergence of the Southern agricultural tradition and recent Hispanic influence. They were delicious. You are one amazing woman. Daddy would be amazed too. yum! 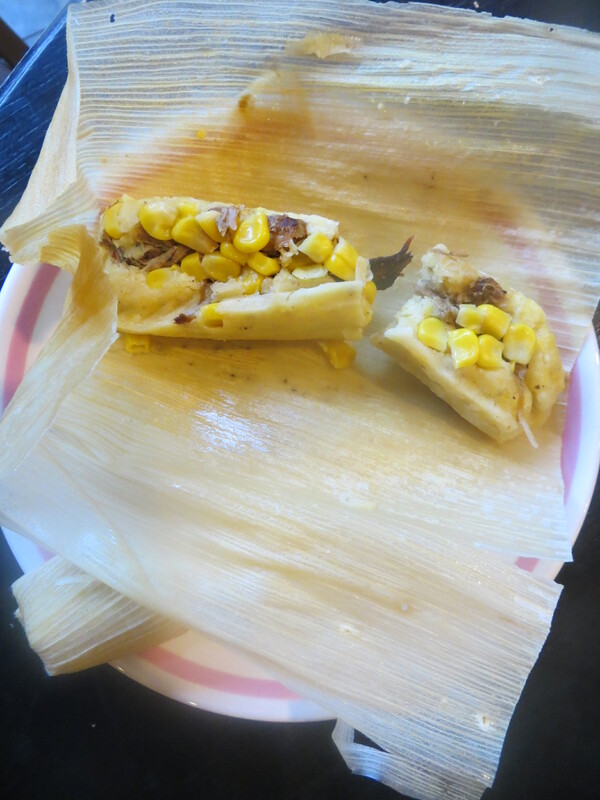 can’t say I’ve ever had a proper tamale…… what a great idea to grow field corn to grind into your own cornmeal! Thanks. I have not ever ground my corn for cornbread, just made hominy and masa, but I’d like to. I don’t have a grinder or Vita-mix (or the like), so I cook the corn with slaked lime first so it is soft enough to grind in the food processor. I keep debating if I should get a Vita-mix that is powerful enough to grind grains. Right now, I am happy with what I have. I just bit the bullet and ordered one- someone shared a link on Asheville Mamas (are you familiar with that yahoo group?) and the reconditioned ones were on sale with free shipping. still a LOT of money, in my opinion (and general budget), but I’ve been thinking about it for so long I decided to go for it. even the reconditioned ones come with a 5 year warranty…..
Good idea. I am considering one . . . we’ll see.